LOVE THIS BED! This bed was easy to put together and looks awesome! The quality of the wood is beautiful and the style is very versatile. It has an industrial feel to it but can be paired with many other styles. Save space and bring rustic charm to your bedroom with the Montauk platform bed. Constructed completely of solid wood from renewable sources, this bed is available in a rustic walnut or driftwood finish. The angled metal hairpin legs add an industrial, mid-century flair that perfectly completes the minimalist design. Super easy to assemble, did it all on my own in about 40 minutes. Real pine wood, the finish is smooth clean. Care full with the support beam that runs down the middle of the frame it’s unfinished be on splinter alert. Other than that extremely satisfied! Fit my queen bed like a glove! This package was almost so heavy we couldn't get it into our apartment, so bravo to the UPS man who brought this beast up three flights of stairs. The bed is extremely straightforward to assemble and is even designed so that one person can easily put it together—though it goes faster with two, obviously. The center support design is brilliant, with a separate plank and solid wood legs to support that middle part of the bed. I've never had the center legs stay put before, but I know these will. Beautiful end product, and simple enough to match any decor. Happy with this purchase and with the protective packaging it arrived in. They also included extra hardware for assembly, which was a thoughtful bonus. LOVE the low profile of this bed. We bought the walnut colored option and are delighted with it. It was straightforward in terms of putting it together and the hairpin legs are sturdy. Happy with the purchase. This bed was exactly what I was looking for. The set up is pretty easy (easier with a power drill) and it looks great. It is well made and solid. Beautiful bed~ Very sturdy and attractive! 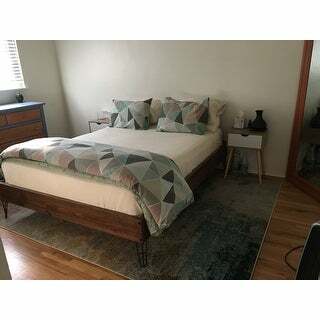 Very happy with the bed, it's very stylish looking and was very easy to put together. I'm very happy with the quality and modern look that it gives the room. "Can a head board be attached to this bed?" The back of the bed is made of wood, so it is possible . You most likely will need to drill either the bed or the headboard posts, then attach both with wood crews. "Is it possible to use a bedsprings in addition to using a mattress with this bed?" Yes, a box spring can be used, but it will be a very tall bed. "hi what is the clearance under the bed? thanks"
There is 8 inches of clearance under the bed. "How far apart are the slats spaced?" "What is the weight capacity for this bed? Are the legs very sturdy? My dogs like to sleep with me and they total 250 lbs." The weight limit for this bed is 700 lbs.